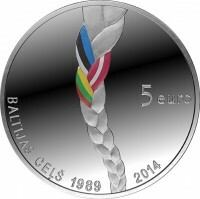 The obverse is crossed by a braid with ribbons in the colours of national flags of the three Baltic Republics woven in it. The inscription "5 euro" is on the right. The lower left part of the obverse bears the semi-circled inscription BALTIJAS CEĻŠ 1989, with the year 2014 on the right. The edge features two inscriptions LATVIJAS BANKA and LATVIJAS REPUBLIKA, separated by rhombic dots. In 1991, the Baltic nations regained their statehood and political independence. The withdrawal of occupation troops, admittance of the Baltic countries to the United Nations and later to the European Union, NATO and many international organisations were natural milestones in their subsequent journey. On 30 July 2009, UNESCO included the documentary testimonies of the Baltic Way in the international register "Memory of the World". 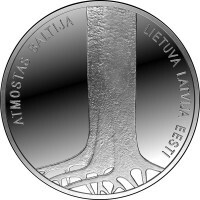 This Latvian euro coin is dedicated to the 25th anniversary of the striking event demonstrating unity among the three Baltic nations.